Long ago, in a time of warriors and peasants, of sword and of quill, kingdoms were forged by the men who were bold enough to claim them, skilled enough to defend them, and wise enough to preserve them. A king was a leader, a protector, a warrior. In those days men were strong, and so were the women who would lay claim to their hearts. For to rule a country is no easy task and to be helpmate to such a man as would rule required every bit of fortitude, wit, and skill a lady could possess. 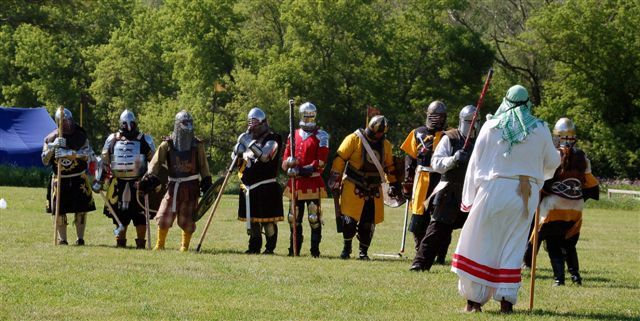 Such are the inhabitants of the SCA. What is the SCA, you ask? 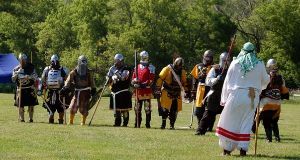 The Society for Creative Anachronism is an international organization dedicated to researching and re-creating the arts and skills of the pre-17th century world, with the main focus being on Europe. Our Knowne World consists of 19 kingdoms, with members residing all around the world. In terms of the SCA, Monroe and Juneau counties in Wisconsin are known as the Canton of Coille Stoirmeil. The Canton is located within the Barony of Jararvellir, in the Kingdom of Northshield. Welcome to our Canton! Come rest from your travels and warm yourself by the fire in the hearth of our great hall. Our cooks will see you well fed. Our bards are eager to entertain you, they sing and dance and play music pleasing to the ear. Our brewers and vintners keep us well stocked in mead and wines. Our armourers and smiths will make any repairs you may need. Should you desire weapons you will find them in our armoury. We have good steeds in our stables if you are in need of a mount. Should you require supplies our merchants and artisans will be happy to assist you. What’s that? Almost dark, you say? No need to worry. Our fighters man their posts on the walls and in the gatehouse of our humble keep. Our archers stand ready with the bow. We are a small, proud, and noble band. Come with us as we revive the time of knights and their ladies, when warriors were poets. A time when kings were made by their prowess in battle, and kingdoms won and lost by the stroke of a single sword—where honor and chivalry ruled the day. Here in our great hall you can learn of our meetings, our events, our guilds, moots, and fight practices. You are most welcome to look around and tarry as long as you wish. We hope you enjoy your stay. Standard Disclaimer: This is the recognized Web Page for the Canton of Coille Stoirmeil of the Society for Creative Anachronism, Inc. The maintainer of this site is Edmund. 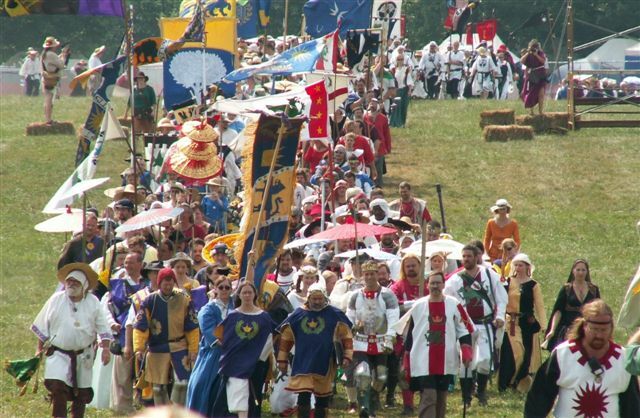 It is not a corporate publication of the Society for Creative Anachronism, Inc., and does not delineate SCA policies. In cases of conflict with printed versions of material presented on this page or it's links, the dispute will be decided in favor of the printed version.